Sixty seconds seems like a relatively small period of time, if you asked me what I believe I could achieve in a sixty second time frame I would probably admit to it being not very much. So just what does happen around the world in one single minute? Web design company Go-Gulf.com has produced a fact packed infographic which will totally change what you believe is possible within such a minuscule time frame. The report and infographic, which comes via a BGR article contains some quite mind blowing statistics outlining just what takes place across various platforms and within certain companies in a sixty second period. 710 computers will be sold, 555 of them containing an Intel product. 232 computers have become infected by malware (32.6% of computers sold). 2.6 million CDs, containing 1,820 TB of data created. 450 copies of Windows 7 sold. 12 websites have been hacked after a 416 attempts. 1,400 discs are rented on line using redbox. 950+ purchases on eBay, with 180 of them coming via a mobile platform. $219,000 of total payments transactions through PayPal with $10,000 being from mobile. 1,100 acres of land farmed on line in FarmVille. A total of 11 millions conversations taking place through various instant messaging platforms. 2 million internet users watched content not suitable for the general audience. $75,000 added to Google revenues. 2,100 check ins through the Foursquare service. 2,500 ink cartridges sold for various printers. A staggering 38 tons of e-waste generated. 18 Amazon Kindle Fires sold. 11 Xbox 360 consoles sold. 81 Apple iPads and 925 iPhones sold. If you are anything like me then some of the statistics above will be very surprising indeed. A selection of them you may have been able to predict, and a couple of them are just plain worrying in all honesty. I have never personally seen the attraction of Farm Ville, but 1100 acres of land being virtually farmed every waking minute seems to indicate that the world has a high number of productive virtual farm hands. One entry which does make me smile is the amount of Apple iPhones being sold every sixty seconds compared to Blackberry devices. In fact, Apple are nearly selling as many iPads as RIM are selling BlackBerrys. 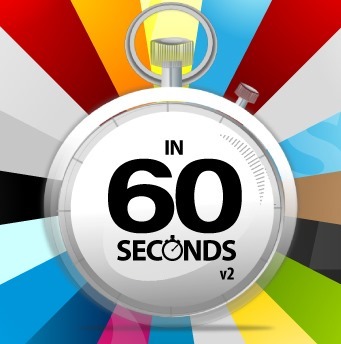 Any of the sixty seconds stats jump out and surprise you?